Facebook Page, Standup Paddle Arizona, for a few weeks before I contacted its author, Chad Brockman. I finally caught up with him during his race training season. He was paddling about 7 miles a day for the 10.5 Parker “Another Dam Race”. So many people have enjoyed SUP with man’s best friend, but not so many have surfed a chest high set or two. I asked Chad to fill us in on some of the fun he has had with his dog, Red, and SUP. Chad Brockman of Standup Paddle AZ and his cool dog, Red. We paddled over to the bigger wave break and caught a decent ride. I fell off and tangled up with Red. He came up grasping for air, climbed over me, coughed a little salt water and gave me the look, ‘Get on the board dad, let’s catch another one!’ Surf On… We paddled out and caught even bigger waves, I was still recording. During a lull, I saw some dolphins. I paddled over as Red looked for them. I knocked my paddle three times on the board to get their curiosity. It worked! They surfaced within a couple of feet next to Red and me. Red saw them and remembered them from our fifty Dolphin paddle in Rocky Point. This time there was just two, a pair of 12 plus footers. What a feeling of being welcome within the ocean society. Back to the lineup to catch a bunch more waves. Red ruled the nose as I caught waves from shoulder height to overhead in size. We were loving the performance of my 12 foot SUP, it surfs with ease, dog and all. I have to brag a bit, Brockfish Boards always work better than you can perform. We caught our last wave and headed into a Sunday family gathering. Fifty-six years ago this month, when I was 13 years old and living in Hollywood, Florida I was bitten by the surf-bug. None of my friends surfed, we had mush for waves at our beach, so I’m not quite sure what got me so obsessed. It was probably from the millions of waves my dad set me riding using a hard canvass raft that I loved from age 5. I could never get enough of the beach, of waves or water. It does follow that by the early 1960’s if I saw someone riding a wave while standing on a surfboard I’d want to give it a try. There were no surf shops at the time, but my dad was a general contractor, a wood-worker to the core. I dragged him to my junior high school shop and together we begged for a spot in the January 1963 semester shop class so that I could build myself a surfboard. “Absolutely not!” was the reply. Girls took Home Ec and boys took Shop (Seriously???? My reaction was an entirely different story, but we won’t go there right now). There was also no Internet in those days so we couldn’t just Google a set of plans. So, on a large sheet of butcher paper my dad drew a “sorts” shape of a surfboard and proceeded to load me into his truck so we could head off to Mack Lumber Company to buy some marine plywood. Many weeks of cutting, sanding, gluing and painting later I saw my first surfboard come to life. Never having seen or touched a “real” surfboard I found no fault in either the design (absolutely flat bottom, no rocker) or the weight (a good 45 lbs – dry). Dad had provided the infrastructure to keep the board solid and hollow. In spite of side seams sealed with a nice band of duct tape and marine paint (navy blue) the surfboard had a habit of filling with water after every ride. It was pretty hilarious to see a bunch of skinny-legged 13 year-olds dragging that beast ashore, pulling out the cork drain plug and draining sea water after every ride. We didn’t care, we were SURFING!!!!! A few years later a small Greg Noll surf shop opened at Hollywood Beach. It was 1965 and I had just started dating Ed. The big blue wooden surfboard was beginning to show some wear and Christmas was approaching. Did I beg for one of the used fiberglass boards (ever aware of limited gift-budgets)? Oh YES!!!! Well, Mom was not so excited about my surfing obsession and she generously gifted me with holiday dresses, a record player and a small transister radio. Mmmmmm, what’s a kid to do? Work and earn the $35 needed to get my surfboard asap! By February I had my 8’6″ Atlantic surfboard and Ed had saved enough for his Dewey Weber (wow! was it beautiful) and we surfed our way through high school. College loomed ahead, budgets were tight. By the end of Summer 1967 both boards were sold as we headed north for school. Our surfing days seemed over. Thank goodness for standup surfing and the surf culture in land-locked Bend, OR. By 2007 we rode our first waves in 40 years. Now, almost 56 years to the day that my dad took on the surfboard project our water fun is boating on the Deschutes and Elk Lake. He (in that photo age 92) loves to hear every detail about every surf adventure Ed and I enjoy. He watched YouTube videos of every sort of surf and paddle story he can find. I know that he always secretly wished he could stand on a board some how. 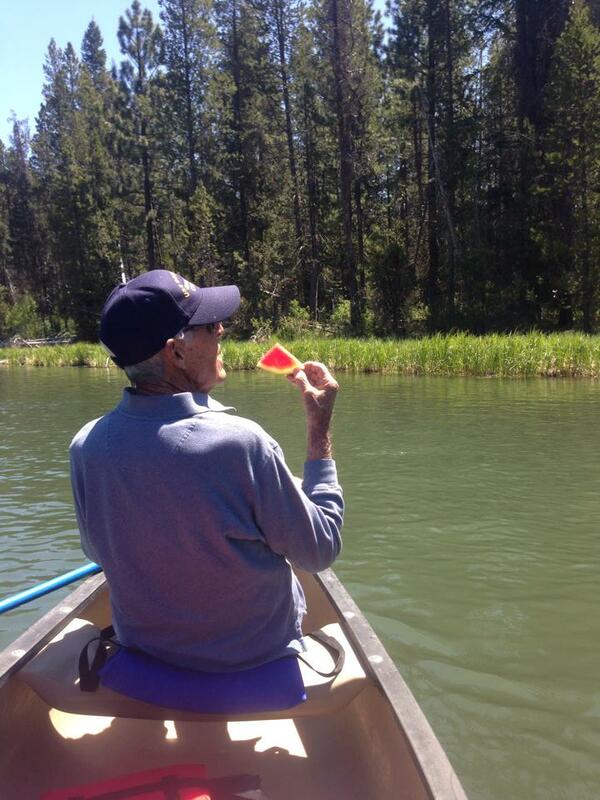 My goal – on a warm day at Elk Lake this summer I would have loved to get Dad on a board, even if just for a few minutes. He’s my favorite board shaper and I’d love to see the grin!